What is the Beaded Prayers Project? The project engages people of all ages and backgrounds to create beaded packets that contain their prayers, wishes, hopes or dreams. Each participant creates two sealed beaded packets: one to keep in celebration of individuality and the other for the travelling exhibit, Beaded Blessings, which is displayed in sites throughout the world in celebration of unity and diversity. Who started the Beaded Prayers Project? Chair ofthe Craft/Material Studoes Department at VCU School of the Arts in Richmond, Virginia. Why is it called the Beaded Prayers Project? The word prayer is used because the project comes from the Old English word for "bead", biddan, which means "to ask or to pray". Sonya Clark combined the history of the words "bead" and "prayer" with her research into the healing and protective amulet traditions of the African Diaspora to create the Beaded Prayers Project. What do the beaded prayers look like? The beaded prayers range in dimension from 1" x 1" to 4" x 5". Each has a written wish, hope, dream, or aspiration inside and at least one bead on the outside. Almost all are made from cloth embroidered with beads but a few are made entirely with glass beads or other materials. The differences in sizes, shape, colors and technique add to the sense of individuality within the collective display. What is the Beaded Blessings exhibit? 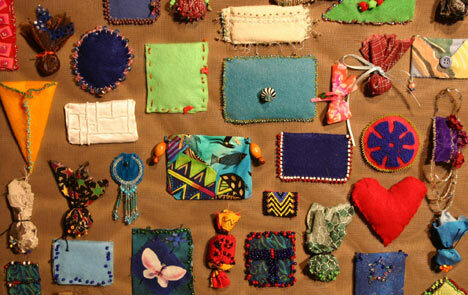 Beaded Blessings is the name of the travelling exhibit of beaded prayers that have been contributed to the project. The first venue for Beaded Blessings was the Gallery of Design at the University of Wisconsin-Madison in November 2000. The project has been displayed at the Canberra School of Art in Australia and many venues in the USA. Additional national and international venues are currently being considered. As new beaded prayers are received they are added to the next available venue. How are the beaded prayers displayed? The Beaded Blessings exhibit is comprised of all the contributed beaded prayers. They are pinned on over 70 2' x 2' panels and arranged on wall to create a quilt-like display. Only one side of each beaded prayer shows. The names of all of the participants are listed alphabetically with a general description of the project. Where space allows, additional objects are displayed including a West African garment and hat covered with amulets, African beads, and photographs of workshops. Who has participated in the project? Over 4500 participants ranging from 6-90 years old from all over the world. The photo at the right shows participants from a Beaded Blessings Exhibit. How many beaded prayers have been made so far? Over 4000 have been made since many of the participants have contributed more than one to the project. Who has funded the project? The initial funding was from the Edna Wiechers Arts in Wisconsin Award from the Arts Institute at UW-Madison. Subsequent support has been provided by the Beckner Endowment from the School of Human Ecology at UW-Madison, the Ford Foundation, and Research Grants from UW-Madison. What other information can you tell me about Sonya Clark? Sonya Clark is a professor of Textile Design in the School of Human Ecology at the University of Wisconsin-Madison. Her training includes a Masters in Fine Arts from Cranbrook Academy of Art, a Bachelors of Fine Arts from the Art Institute of Chicago, and a Bachelors in Psychology from Amherst College. She has taught at the Kansas City Art Institute, Maryland Institute College of Art, Philadelphia University, and Tyler School of Art. She has conducted workshops at the Baltimore Museum of Art, the Smithsonian Institution's National Museum of African Art, the Nelson Atkins Museum, the Hampton Museum of Art, Haystack Mountain School of Crafts, and Penland School of Crafts. She is the recipient of several grants including the 2000 Wisconsin Arts Board Grant and the Lillian Elliott Award. She has exhibited in over 100 solo and group exhibitions nationally and internationally. The Beaded Prayers Project and Beaded Blessings exhibit is Sonya Clark's way of extending herself into the community, connecting with people through art outside of her own studio work, and creating an artwork that belongs equally to all of its participants.